finish interlocking logs. We believe this product looks amazing and comes at an affordable price. Find out more about our Pub Smoking Shelters range. With great gusto the British seek the enjoyment and cheers of friends the moment the sunshine appears, yet whilst dashing to the bar the rain takes it chance. With our Pub smoking shelter you can still bathe in the sun without worrying about the ever changing conditions of the weather. 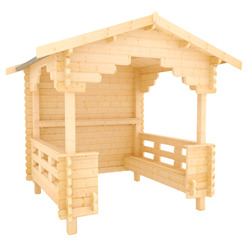 The interlock logs provide resistance against wind and rain and weighted by the roof the shelter will remain sturdily in place.